Why choose us for your Stansted Transfer? We travel, some of us forever, to seek other places, other lives, other souls, Anaïs Nin said. It really doesn’t matter why we choose to travel, it’s important we do it. Whether you are visiting London, or you are a Londoner going abroad, the information we will be providing for you in the next lines is both efficient and necessary. Before making arrangements for your departure, you should know a few things about the airport you’re about to land. Located in the district of Uttlesford in Essex, London Stansted Airport is the fourth busiest airport in the United Kingdom judging by the passenger traffic. There, you can escape the hustle and go to lounges or grab a bite to eat in the restaurants. A shopping session is also something you can enjoy while waiting for your flight. It’s one of the fastest ways to travel between London and London Stansted Airport and the best part is that trains depart every 15 minutes. If you pre-book your Stansted Transfer, tickets start from £7 per person. To and from London Liverpool Street, the train takes just 47 minutes and the services start at 03:40 am. Best suited for individuals, families, and groups, traveling by coach is a cost-effective option and convenient. National Express provides coach and bus services between London and airport, departing regularly with journey times from 50 minutes. Tickets start from just £5 one way. You can also consider a private coach hire in London provided by 247 Coach hire. Send them a quote request at http://247coachhire.com/ and they’ll happily respond to you with their best offer. You can hire a car with the Stansted Airport official partner, Rentalcars.com, in only 3 simple steps at the best price guaranteed. There is always a car for every budget and preferences. Book a private hire minicab services in advance or take a black cab. Careful though, the black cab is approximately 50% more expensive than a minicab. For the best Stansted Transfer services available in London we recommend using 247 Stansted Airport Transfer. 247 Stansted Airport Transfer has a comprehensive experience in minicab services of over 7 years. Their young and enthusiastic team will make sure the customer is pleased with the journey and they arrive in time at the destination point. The company respects all British policies and cares for the environment, ISO 9001 and ISO 14001 accreditations prove just that. Because we care for our clients, our drivers and operators received training from Gram Training and they have an NVQ Certificate, Level 2 in Road Passenger Vehicle Driving and Transport Operation. They also receive a Certificate in Exceptional Customer Service. We are part of London Private Hire Car Association – LPHCA, Members of Confederation of Passenger Transport UK – CPT, coach and bus industry representative in the UK, European Tourism Association – ETOA member since 2015. Instant confirmation of the booking by email and text message. This is only a small list of benefits that you can get by allowing us to offer you a relaxing and enjoyable ride to your London destination. 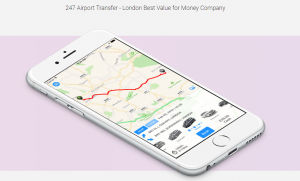 You can book your ride in no time by downloading our app on your smartphone (available for both iOS and Android) or by accessing our website https://247airporttransfer.co.uk for an online booking. Also, our dedicated operators are always ready to help in case you encounter any technical problems, you are not satisfied with the prices or you need any help at all! It is advisable to book with at least 3 hours in advance just to be sure that we have your required vehicle. Harwich International Port is one of the Haven ports, situated in Essex, England. It’s open 24/7 and tries to ensure that its customers are receiving quality services. If your cruise is arriving/leaving in/from Harwich Port, the best option for you is to opt for a Stansted to Harwich Port Taxi Services offered by us. A ride with us on this route will take approximately 1 hour and 7 minutes, you won’t have time to get bored. Give us a call or send an email at [email protected] and benefit of the best price. A Stansted to Victoria Station Taxi with 247 Airport Transfer will take approximately 1 hour and 15 minutes. The transfer from Stansted Airport to Victoria Station will cost around 58 GBP for a saloon car.